The magnificent images of John Cooper. Once again capture the elegance of his attentions. 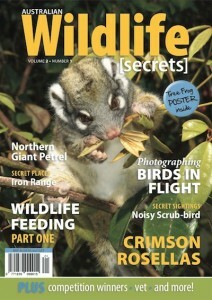 The Crimson Rosella are revealed through the magical optics of john’s lense and will come to life within his article. Wildlife Feeding – To feed or not to feed? We gathered some thoughts and expressed them on what is a controversial and mixed topic. So what are the problems with wildlife feeding? Hy can it be either good or sometimes bad? In part 1 we examine the aspects from several viewpoints. In his travels to the Iron Range, Michael Cermak reveals the secret world of our Irona Range where new guinea meets Australia. Whats so special about the wildlife in these ranges. Chris tate travels to south western Australia to find the elusive Noisy – scrub bird. Filled with history this bird is back from the brink. Morton Henderson takes us into the suns orbit and reveals Sun meets mercury. A secret planetary sighting! Tracey Wilson, expoloits with Wark the penguin made famous in issue 1 . Now e learn about the rehabilitation and release of the gigantic northern Peerl a pelagic species that needs a runway, strong winds and a enormous feed. Go Peterl Aorways. The naturalist Ken Griffiths, reveals his secret tips into photographing birds in flighjt. Befre you get frustrated in the facet of shooting birds with a camera – read further and gain the insight and technique to really get those majestic in flight images. Dr Tristan Rich delves further into rehydrating wildlife. He explains and details the various methods and techniques for rehydrating injured wildlife. Well they poured through the email. Readers love showing their images. We selected a range of winners and here we show you first hand.